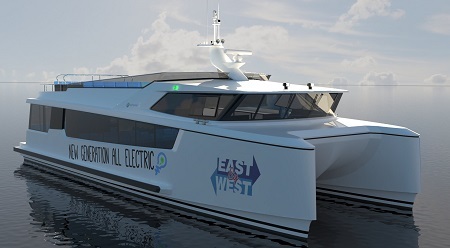 SSC Marine Ltd are pleased to announce the design of New Zealand’s first all-electric passenger ferry. A joint venture partnership with Kit Carlier Design, Stimson Yacht Design and Naval Architecture and Tennant Designs, SSC Marine Ltd company will focus on designing energy efficient commercial craft. The plan is to design the next generation of high efficiency catamaran hull forms, building on the Tennant database and drawing on the team’s decades of experience. The new 19m, 20knot, 130 passenger ferry has been commissioned by East By West Ferries in Wellington and will be utilizing electricity generated entirely from renewable sources, thus as a result this all-carbon construction and all-electric vessel will have zero carbon emissions operationally. The vessel is designed for East By West’s Wellington cross-harbour ferry route and to be built to survey under Maritime New Zealand. A newly formed build company – the Wellington Electric Boat Building Company – headed up by experienced boat builder, Fraser Foote, will manufacture the vessel in its new Seaview premises in Hutt City. Construction will be all-carbon, epoxy, foam construction engineered by Gurit in Auckland, assembled from CNC-cut infused panels, with only the lower hulls being moulded with a materials pack from Gurit Asia Pacific. The flat panel topsides construction lends itself to a chiselled look and in this way tooling costs are minimised, assembly time sped up and structural weight reduced to enable the electrical propulsion system to be viable. McKay’s Electrical of Whangarei have worked closely with SSC Marine Ltd to define the electrical propulsion and battery management system. McKay’s will design, supply and install the system that will allow the vessel will operate at 20knots service speed, running at the rush-hour peak three back-to-back 25-minute runs with dip charges at one side only before a 1hour recharge is required. The adoption of full carbon/foam construction is the enabling technology which when combined with the highly efficient canoe-stern hull form reduces the resistance and so allows the weight (and therefore cost) of batteries to be minimised. The life-time costs of the vessel’s energy consumption and maintenance costs are reduced to the extent that the higher initial construction costs are paid back well within the operational contract time-frame, and a higher profit per passenger per trip is returned.